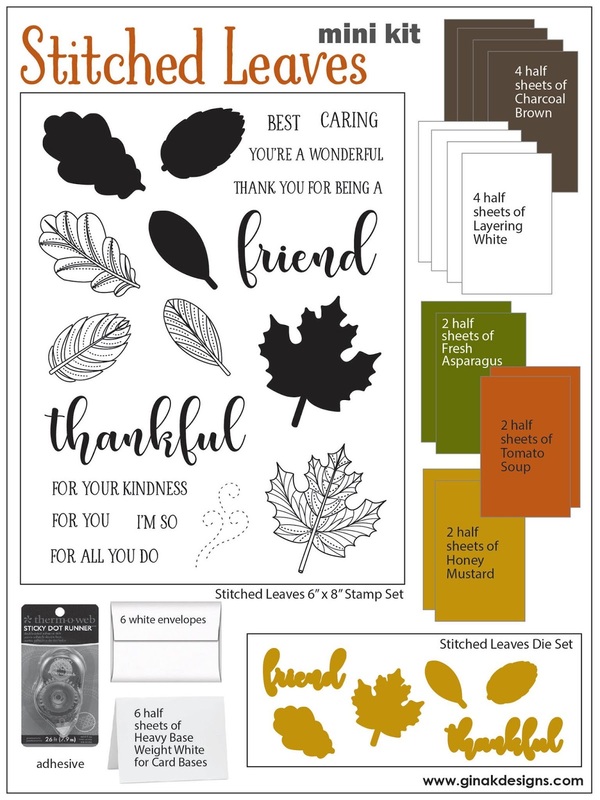 Created 4 Creativity : Gina K, Designs Inspiration Blog Hop - Stitched Leaves Mini Kit is back in stock TODAY! Gina K, Designs Inspiration Blog Hop - Stitched Leaves Mini Kit is back in stock TODAY! 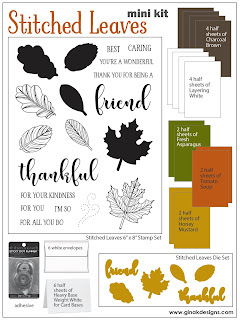 The Cast and Crew for Gina K. Designs welcomes you to our blog hop celebrating the new Gina K. Designs Stitched Leaves Mini Kit which will be back in stock TODAY! I know so many of you are still wanting this kit and today you can have it! Enjoy the samples from the team and then comment on each blog for your chance to win a $50 Gina K. Designs gift certificate! To see who won, check the Big News Forum at StampTV a few days after the hop. Now I just couldn't share only one card with you, so here is another with a completely different look. I hope you like it and will find it inspiring as well. LOVE the one with the soft coloured background!! So pretty Susie! So gorgeous! Love the white stamped images and the sponging! Your cards are wonderful!!! You totally captured a new look to this kit!! These cards just glow, fantastic, Susie! These cards are beautiful! Love the background with the blended colors. Turning your stamp or die is a neat idea. So much inspiration in this hop. Both cards are so pretty! Thanks for sharing your talent! Beautiful cards! Love the colors! Thanks for sharing! So pretty and I can't wait for my kit to arrive as I'm dying to try out some of the designs I've seen. Very lovely cards! Thank you for the inspiration! Both cards are beautiful. The background colors on the second card is wonderful . Lovely use of color with this stamp set. Love both of your cards! The 2nd one looks YUMMY! Great cards - like the colors! Your colorful cards make me smile, Susie! Love your designs -- thanks so much for sharing! Great cards with lovely colors used. Beautiful coloring on both your cards. The white adds so much! GORGEOUS cards! Love the colors you used! So pretty! Fall is my favorite time of year! Awesome set, a must have! Thanks for sharing! Beautiful cards, love the background on the second card, loving these stitched leaves! I am so glad I found how to get to your blog post using these stamps. Your cards are so gorgeous! Lovely cards!! Like the soft colors. Thank you for sharing. Lovely cards, Susie. I like the word "friend" on a curve! Gorgeous as always. I love the colors. So bright and cheerful. Love go techniques on these cards! Lovely cards. I really like how you did the leaf background. They may be completely different but they are both stunningly beautiful in their own way, Wow!!! Love them!! Thank you 😊!! Lovely cards, especially like the first one! Thanks for the inspiration! Oh my! Let me pick my jaw up off of the floor! Wow...love the cards...beautiful design and colors. Absolutely STUNNING, Susie. I love your creativity with these fabulous stamps. I'm just crazy for that 2nd card! Great job! I love your BOLD use of color on your first card and your subtle use of color on your second card.. both are A-mazing and very inspiring!! Oh, my goodness! These cards are just gorgeous! Thank you for sharing! Love your fresh, gorgeous cards! I just this week saw a video on the white embossing technique with watercolor, & can't wait to try with this wonderful set! Awesome! Pretty cards!! I love your design with the color shadow under the white word die on the white card. I really love your colorful background with the white leaf details and your curved friend die to fit the circle!! Yowza! I find that second card enchanting!!! I love your cards, but especially the second one! Your cards are both beautiful! I love the colors you added to both cards! Great cards with stunning colors. The beauty of ALL of these cards using this kit is simply mind boggling! 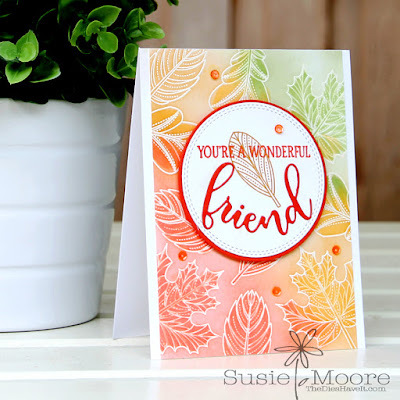 Susie, both of your cards are great but the background colours on the second on with the white embossed leaves is just gorgeous. Very well done my dear! Your cards are beautiful. Love the colours you used. Sweet cards. I like the colors. Love how both these card colors are so different--bold and other subtle--yet both are grandly created. Thanks for showing off this stamp set and how stunning it can look.